Why the Worcester Tea Party? 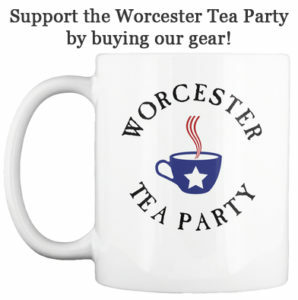 The Worcester Tea Party is a local, all volunteer, non-profit organization. Across the greater Worcester County area we are building the bottom-up organization to return our country back to the principles that made her great. We need to connect with our neighbors to form strong local groups, ready to take on whatever challenges we face. Together, there’s no limit to what we can achieve. The Worcester Tea Party has become the heart of a network of Tea Party groups sprouting up all over Massachusetts. We share information and ideas with other local Tea Parties across the country. Our task is enormous. The Tea Party movement has re-awakened the power of the citizen activist in our country. To succeed, we’ll need all Americans no matter how they may have voted, to join us in the work ahead. Nothing is more powerful than your voice in your community. Your voice can support leaders who share our values, and are ready to carry forward our fight for individual rights. Make your voice heard and restore fiscal sanity to Washington DC, the State House and in all the cities and towns of the Commonwealth.